In order to do astrophotography (aka "imaging"), dark skies are a necessity - with the exception of narrowband imaging. Otherwise, the long exposures required to capture deep sky objects would either end up completely burnt out by the sky glow created by "light pollution", or you will simply not get enough good data (signal, or more specifically signal-to-noise ratio or SNR), as it will be buried in the skyglow. And the light pollution we have in the Silicon Valley, although it's not Las Vegas, it's probably as close as it gets. Another requirement for astrophotography is of course clear skies! You cannot take astrophotos through a cloud! And boy do we have clouds here! Here, the norm is sunny skies during the day, but overcast at night. This trend is caused by the marine layer (fog) that often stays at the coast but when it gets dark it travels inland more often than I wished. Folks a bit far from the Santa Clara valley (Gilroy, the Livermore Valley, etc) get more clear nights, but those of us stuck in cities such as Sunnyvale or San Jose don't enjoy such luck. And of course, you also need good transparency and "seeing", but the only way you can try to beat that (and not always successfully) is by travelling to higher lands. Fortunately, there are a few sites around the area that help us overcome these problems: they're somewhat away from city lights, are usually away from the fog, and provide some decent altitude - but nothing dramatic, 2600~2800 feet at most (800~850m). 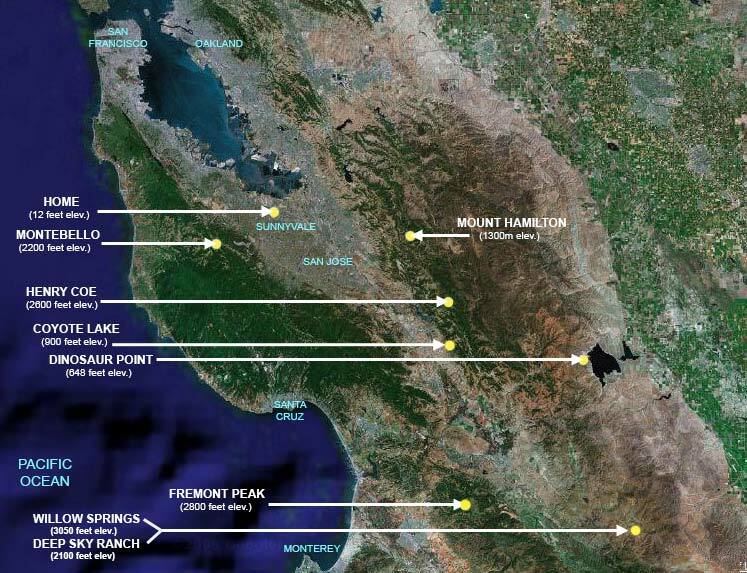 Below you can find some of the favorite sites for amateur astronomers and astrophotographers around the Bay Area, myself included. To get more information about each of them, click on the link. To see where all these sites are, see the maps below the links. Here's a satellite view of the Bay Area indicating where my home is, as well as the sites I often go to do astrophotography. Only Mount Hamilton is not a regular site for the reasons I mentioned earlier. 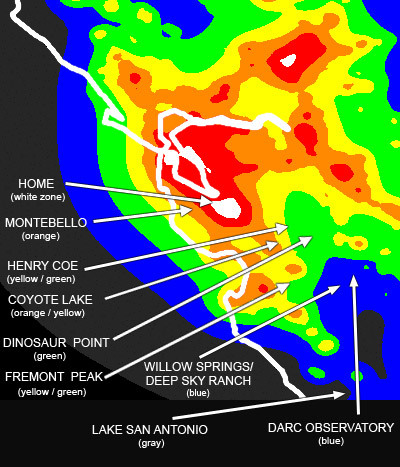 Here you can see a similar map, except that this one is colored using the Bortle Dark-Sky scale to indicate the light pollution levels.